We produce 3-ply laminated access matting and steel-frame rig mats for a number of applications, including oil and gas exploration, hydro, and construction for creating temporary remote access roads, camp and drilling pads, and safe, stable work platforms capable of supporting heavy equipment on soft, muddy lease sites or muskeg. Access matting also minimizes ground disturbance on the work site, preventing damage to environmentally sensitive grasses and subsoils where zero ground disturbance is necessary. Our 3-ply access mats are an effective, environmentally friendly access solution, whatever your situation. 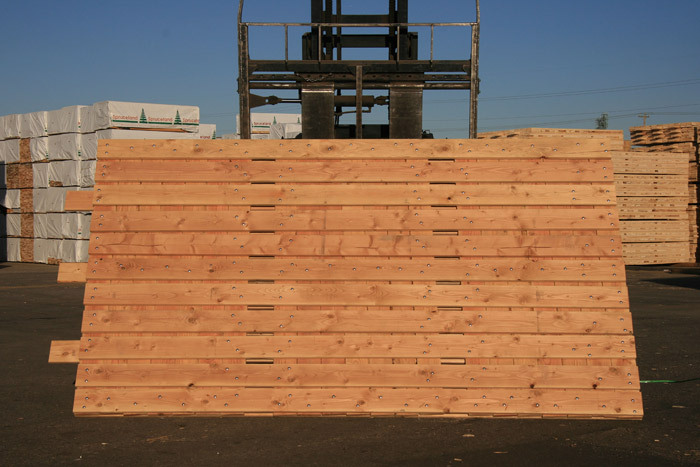 All of our 3-ply access mats are made from rough sawn 2 x 8 Douglas fir, bolted together with 175 3/8" carriage bolts. We use a 7/8" flange on our nuts to distribute stress evenly on both ends of the bolt. Standard dimensions are 5" thick, with a surface of 8' x 14'. Three interlocking fingers on each mat allow them to be placed end-to-end to create a stable surface. We keep a large, constantly renewed inventory on site, available for immediate delivery. We also produce 30,000 mats per year, so we can keep delivering until your access solution is in place. Custom sizing, configuration and species selection are available, in addition to our standard mats.